The Bespelled: While I had previously read this novella it was nice to read it again. It does show a much more abusive Al than the one he has grown to be since being influenced by Rachel for so long. I really love that demon, even if he was rather horrible to Ceri, but then again she really doesn't have anyone to blame but herself as this novella showed her choices. Two Ghosts for Sister Rachel: This was another previously published novella, but one I hadn't read prior to this collection. It was really interesting to see how very different Rachel was back when she was still weak from her childhood. I feel like after reading this that I understand why she is the way she is and her choices so much better. It was in this novella that she learned taking risks is really the only thing that makes her feel truly alive. Also, even though I'm not the biggest Pierce fan, it was fun to see their initial introduction. Undead in the Garden of Good and Evil: Another novella that I had read before, this one shows Ivy in the past right before she met Rachel. I'll admit that I wasn't thrilled about the Kisten and her parts as in my mind he always belonged to Rachel. That being said, this novella gave a really good picture of the mental abuse that both Ivy and Kisten endured over the years. The manipulation is absolutely horrifying, but this novella seemed to show the turning point for Ivy as she finally started to want something more for herself. Dirty Magic: This one was a new one for me, and while it was enjoyable for the closer look into Mia, I can't say it was my favorite of the Hollows novellas. I'm just not the biggest fan of Mia, so seeing her use someone so cruelly only turned me off even more. The Bridges of Eden Park: I had read this one before, and it still makes me so sad even now. I just miss Kisten so much. His death really stunk, and while I am far enough past it that I can understand Kim Harrison's reasoning that he needed to go, it still is hard. That being said, this is a very enjoyable little outtake between them with both action and sentimentality. Man I miss that guy! Key Line Drifter: Again, another I had read previously. This novella shows Jenks with his first solo/personal job. I felt like it really accentuated just how unusual he is compared to other pixies. Of course those differences are what make him completely awesome. It also was fun to see him team up with Bis and the trouble they get in to. Million Dollar Baby: If nothing else, this collection is absolutely worth reading just for this novella alone. I am a huge Trent fan, in fact he is the only male character I have even come close to accepting since Kisten's death. It was really enjoyable to get a better look into his head. I found it interesting to see just how much Rachel's opinion of him matters. He always seems so closed off, it was amazing to realize how much turmoil is going on beneath the surface. Trent really hates the things he has had to do to protect his race, and wants to do anything he can to stop the deaths that seem to surround him like a heavy shroud. I also loved seeing him meet his daughter for the first time, definitely heart wrenching! Pet Shop Boys: I absolutely loved this novella. There was just something so yummy about the characters having the characteristics of both vampires and the fey. Seriously, anyone who is tired of vampires due to the heavy market saturation, will absolutely love the premise behind these guys. I really hope something more becomes of this story because I think that would be a truly awesome series to read! Temson Estates: This story was my least favorite of the bunch. It just didn't really spark my interest or attention. The story is about dryads, only in a scientific way, and that's probably where my interest was lacking. I just prefer magic to science in my books. Spider Silk: I loved this story. It was so creepy and mysterious, definitely another one with full series potential. That being said, I felt like it ended rather abruptly, with things left too open-ended for my tastes. But then again, those unanswered questions do leave things more open for more stories, so I guess I shouldn't complain. Grace: This story was awesome, and the premise behind it leads to so many possibilities. I think this is the series Kim is considering on diving into next, so I have to say that I'm really happy about that. Grace seems like such an amazing character, but she also is a spitfire like Rachel, which will keep things more than interesting. However, unlike Rachel, she easily sees her own flaws and instantly takes steps to correct them. It made her rather admirable. 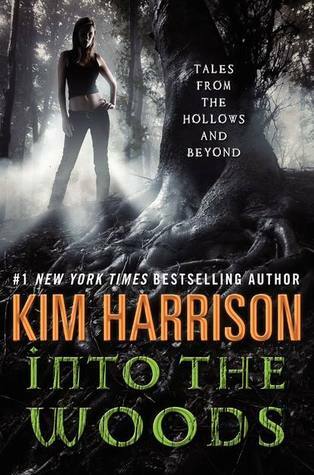 I may be biased, but I think Into the Woods is an absolute must buy for fans of The Hollows, as it gives deeper looks that we don't get to see in the main series. It also was really great to see some of her work outside of The Hollows, since it is winding down and will be soon time to move on. After reading these novellas, I have even more confidence and excitement for what is in store next.